By Asher Stein, D.O., Rohit Gogna, D.P.M. Pseudoarthrosis between the navicular bone and accessory ossicle predisposes individuals to reactive changes in the posterior tibialis tendon and tendon sheath. The resulting posterior tibialis tendon dysfunction can lead to chronic ankle pain and acquired flatfoot deformity. 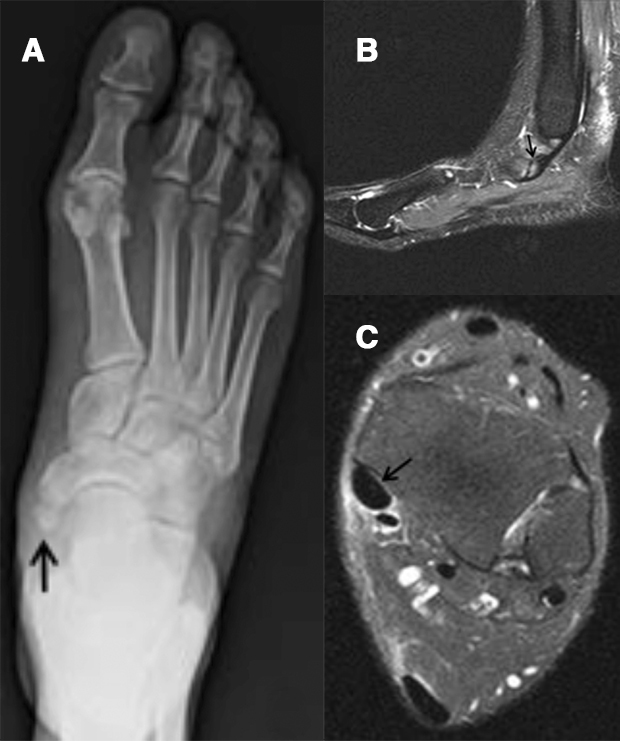 Karasick D, Schweitzer M. MR imaging of disorders of the posterior tibialis tendon. Am J Roentgenol 2000;175(3):627-635. Bariteau J, Chamieh J, Banerjee S, et al. Symptomatic accessory navicular bones: it is not only type II. American Orthopaedic Foot and Ankle Society (AOFAS), 2015. https://www.aofas.org/PRC/meeting/Documents/SymptomaticAccessoryNavicularBonesItis.pdf. Accessed May 1, 2017. Stein A, GognaR. JAOCR at the Viewbox: Posterior Tibialis Tendinopathy. J Am Osteopath Coll Radiol. 2017;6(4):21. Asher Stein, D.O., Rohit Gogna, D.P.M. Dr. Stein works with the Department of Radiology and Dr. Gogna works with the Department of Podiatric Surgery, Cooper University Hospital, Cooper Medical School of Rowan University, Camden, NJ.